Laboratories Services at Dr. Jivraj Mehta Smarak Health Foundation, Ahmedabad have been established with a view to provide wide range of Laboratory investigations necessary for patient care. It consists of disciplines of Biochemistry, Clinical Pathology, Hematology, Immunology, Microbiology & Serology, Infectious Diseases, Histopathology, Cytopathology. All these disciplines provide qualitative and quantitative analysis of biological materials such as blood, serum or plasma, tissue, urine, stool, CSF etc to support clinicians in the practice of medicine. To operate these sophisticated gadgets, the laboratories have a team of efficient, motivated, knowledgeable and qualified doctors and technical staff who are constantly involved in producing world-class results and upholding quality assurance. 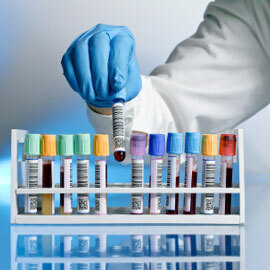 The laboratories at Dr. Jivraj Mehta Smarak Health Foundation provide round the clock service i.e. 24 hrs a day, 365 days in a year, to the patients.